ACL Injuries are now common place. The prospect of ACL surgery requires planning and preparation. The more you know, the better prepared you are to choose the right ACL surgeon, the proper cruciate ligament graft and the proper approach for the entire process. Our approach to ACL Surgery has changed dramatically over the last few years. We’ve changed how we perform ACL surgery, how we rehabilitate your knee after ACL surgery, and we’ve learned a lot about the science of trying to prevent ACL tears. 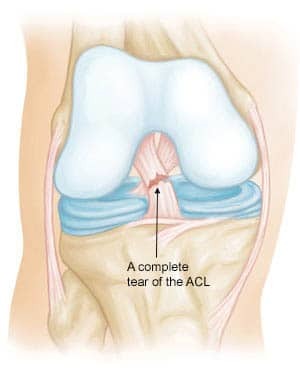 The ACL is the anterior cruciate ligament. It is one of four major ligaments within our knee. The ACL is clearly the most commonly injured of the 4 major ligaments. Most people who tear their cruciate ligament have sustained a twisting or pivoting injury. The most common sports leading to an ACL tear include soccer, football, basketball, and skiing. If you have an ACL tear, you will likely find that you have instability or giving way with certain sports and activities. If you have an ACL deficient knee and you have instability then you are likely considering an ACL reconstruction. For those of you considering ACL surgery, but you’re not quite sure if you need it, you will find this post helpful. The technique for performing an ACL reconstruction has evolved significantly. Over the last few years, nearly all high volume ACL surgeons have gone to an “anatomic” approach. That means that during ACL surgery we put the new ligament in exactly the same position your native ligament was. Believe it or not, that’s not how we were originally trained how to do it. The older technique was easier… which is likely the reason why some surgeons still use it. Take Home Message: An “anatomic” reconstruction has become the gold standard. It is a more technically challenging procedure, so be sure to review with your surgeon what technique they plan on using. Volume matters! An ACL surgery is a technically challenging procedure. ACL surgery should be performed by an experienced ACL surgeon. The complication rate of a low volume ACL surgeon is significantly higher than an experienced ACL surgeon. Take Home Message: Be sure to find an ACL surgeon that performs a fair number of ACL reconstructions each month… not a few each year. When we reconstruct the ACL we need to create a new ligament. We can choose to use your hamstring tendons, a piece from your patella, or a donor graft from cadaver tissue. Different grafts are better suited for different situations. Women tend to be “quadriceps dominant” so a patella graft might better suit their needs. A patella tendon graft might be better suited for high-level contact athletes. A hamstring graft is a strong graft well suited for most all activities. The research shows that a cadaver graft in a young active person should probably be avoided due to a high failure rate. Take Home Message: One graft does not suit all needs for people considering ACL surgery. Be sure to do your research and talk to your surgeon about your goals so the proper ACL graft can be chosen. If you have suffered an ACL tear, you are at very high risk for re-tearing the ACL in the same knee — or tearing the ACL in the other knee. Many people have a predisposition due to a “neuromuscular” impairment. (I hate big words too) That basically means the way you jump, land, pivot, etc needs to be evaluated to correct your biomechanics to dimish your risk of requiring another ACL surgery. Take Home Message: Physical therapy is an absolutely critical part of the overall ACL recovery process. Finishing up with a formal neuromuscular evaluation may play a role in diminishing your risk of a second ACL tear. I hope these tips help with some of the larger issues at hand when considering ACL surgery. What is a Double Bundle ACL Reconstruction? Fast forward 11 years: I am now a certified athletic trainer working at a small college in California. My love for sports (basketball and skiing in particular) is still strong. I am playing in a women’s rec league and as I am going for a power-lay-up my opponent knees me right on the outside of the L knee. My peroneals were on fire and my foot was tingling. I thought I contused the peroneal nerve. As I got up my knee was real unstable and my self-evaluation anterior drawer was positive. When I got home my husband (also an AT) confirmed, and so did our team doc and ortho friend. We decided to fix it upon our return from Europe. I needed this one to be perfect because 3-Peat’s (yes, that’s what I named my R knee) retro patellar cartilage was left a mess after getting really stiff with the 3rd surgery. Due to my previous history I was dead-set on using my own tissue to reconstruct this one, but doc talked me into yet another allograft, this time a bone-tendon-bone one. “They’ve gotten better over the years, it’s a quicker and easier recovery, and just because it didn’t work on the other knee (different surgeon who had retired by now) doesn’t mean it wouldn’t work here, it’s what I would use on my daughter”. That last fact convinced me, because I trusted him. To make a long story short – it was horrible. I should have left the surgery center the morning of when 2 different nurses could not find my veins. As I entered the OR a tech was preparing what was soon to be my new ACL and I told it (under my breath) that it better treat me kind. It didn’t listen. My knee got infected, became really stiff, every time I loaded my quad it felt as if my patella was going to explode. I voiced concern about my retro patellar cartilage so many times that I got tired of it myself, but I wasn’t heard. “Work through it” is what both doc and PT kept telling me. “You need to get stronger and the pain will go away.” It didn’t. And it still didn’t go away after a ton of scar tissue was debrided and the surgeon assured me that my patellar surface looked great. If everything looked so great then why did it hurt so badly? It was time for another pair of eyes to take a look at my knee; or to seek psychiatric help. After careful consideration (this was as much a political dilemma as it was a personal one…team physician, friend) I consulted a high volume surgeon at a renowned Sports Medicine Clinic in southern California. An MRI showed a bunch more scar tissue and that my patellar cartilage was significantly compromised. It also showed that my ACL graft was in a “non-favorable position” which explained why I still felt rotational instability. I asked if the previous surgeon screwed up but was told that that wasn’t the case. Things were simply done differently than this group would do them. “It’s like cooking Lasagna, there are many different recipes” and mine was just cooked after a different recipe… (now you know why my L knee is called ACLasagne, but I am jumping ahead of myself). This was the first time I heard the term “anatomical graft positioning” and unfortunately my graft wasn’t placed that way. After numerous conservative treatments for chondromalacia didn’t help I agreed to a chondroplasty and scar tissue debridement, which also revealed that the ACL graft was frayed, partially torn and overall pretty much useless. I had this feeling for quite some time. A few months earlier (but after the MRI) I was standing in my ski boots (no skis) and turned to talk to a friend behind me and my knee just popped and shifted. I could do my own pivot shift from there on out. I had brought it to doc’s attention but his physical exam was clear. Apparently I had mastered the ability to tighten my muscles just ever so slightly where special tests remained negative, but obviously that did not work while under anesthesia. I am currently just over 6 months out of my 5th ACL reconstruction using a patella bone-tendon-bone autograft. I was just released to return to sports by my surgeon but am patiently waiting a bit longer to give the graft more time to fully mature. Although I have learned a lot about myself from this experience and I feel that I am a stronger person because of it – I don’t ever want to have to do this again. I have just ventured out into the world of biologics, …I am hopeful. Thanks for sharing your story Anja ! I hate that you have had such a hard time with your knees, but I feel like I have to refute some of the comments that have been made. First and foremost, 94% of all ACL reconstructions are successful. If the tunnels are in the correct position and you have strong fixation, you will have the opportunity to have a positive outcome. When someone uses the term “anatomic ACL” I automatically think ” what’s truly anatomic?” 60% of the ACL footprint (on the femoral side) Is connected to the back of the femur. That’s a position that we can’t access unless we blow out the first 5 to 8 mm of the posterior wall. The technique that you keep referring, is a medial portal technique. This means the surgeon is independently drilling the femoral tunnel by Accessing the femur through a portal on the medial side of the knee. The so called “old way” of doing ACL’S is called the trans – tibial technique. This allows the surgeon to use the tibial tunnel to access the femur. So some surgeons say that if your tibial tunnel is placed poorly then your femoral tunnel will be place poorly. It’s true….If you place the tibial tunnel in a bad spot. But there are ways to place your tibial tunnel not only in the correct spot, but also at an angle where you can access the femoral footprint of the old ACL. If the surgeon will cheat his tibial guide toward the lateral wall of the femur, he then will have the same entry point (to the femur) that the “medial portal” surgeon supposedly has. Look, the only reason we started this whole “anatomic” controversy, is people actually started to buy into the rotational instability belief. This was authored heavily by Freddie Fu and the double bundle philosophy. This theory still lives on (mostly in the Asian markets) today. Here in the US, we quickly realized how difficult the is procedure can be. 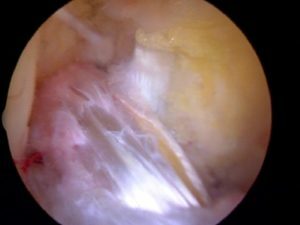 The double bundle ACL is truly the more anatomic technique, but that doesn’t mean that it right for all patients. I truly believe that your knee problems had a lot to do with certain types of issues that many females face. Q – angles, biologic changes during menstrual cycles, hyper – extension and narrow femoral notches. All of the factors can and could have contributed to your failed ACL’S. You would also need to look at how your “allo – grafts were treated when taken from the donor. If it was irradiated, then you will have higher risk of failure. If it was non – irradiated, then studies show a higher rate of success. Either way, allo – grafts do have a higher rate of failure…. no matter how it’s treated. In closing. ..I truly believe that the trans – tibial approach is just as effective as the medial portal approach. If the tunnel position on the femoral side has the same footprint, then it’s shouldn’t matter which approach you take. I would also argue that the trans tibial approach is better considering the tunnels are drilled in alignment. Therefore the graft tends to not piston when the knee moves into full extension and flexion. So please understand that a lot of surgeons like to promote this new technique as a creative marketing tool to move patients toward their practice. obviously you are one of those who have fell prey to that. If your knee feels great, then good for you. But I think you could have had the same result with surgeons that do the “old style technique.” You just needed a surgeon who knew how to perform the “old style” technique correctly. Thanks for stopping by… I think for the purpose of transparency we should let folks know that you run the sports medicine division for Biomet. Anja’s unfortunate situation occurred because of a missed postero-lateral corner injury.. at least with one knee. Missing associated ligament injuries is a relatively rare, but common enough cause of a failed ACL reconstruction. That being said, I do not look at stating you should consider an anatomic reconstruction for marketing purposes. The traditional, vertical, anterior femoral tunnel led to very poor results, positive pivot shifts and poor rotational control. As we moved the tunnel back to the native footprint, which is not on the back of the femur, but instead in the posterior aspect of the notch, our ability to control rotation with an obliquely oriented graft improved significantly. Can a surgeon hit the femoral footprint with a perfectly placed tibial tunnel? Sure.. but that approach makes the femoral tunnel aperture oval due to the angle that the reamer hits the notch cortex. That widens your tunnel anteriorly and risks a posterior blowout. That’s the main benefit of an accessory medial portal. It enables us to come nearly straight at the footprint, leaving a circular tunnel, and we can place the tunnel posterior because our angle our attack will not lead to posterior penetration and blow out. The graft choice is just as important as the tunnel placement. The literature is very clear in this area. Far too many allografts are used, when people have plenty of auto choices available. Educating people who come to this site about the changes that have taken place is my “role” … telling them to seek a high volume surgeon and someone who understands the complexities and subtleties of an ACL recon as determined by some of the finest research minds in the area is NOT a marketing ploy … period. It is meant to educate and inform. Unfortunately, your 94% success rate is not what the literature demonstrates… we know only 43% of athletes return to sport at the same level as prior. We also know from Rugg et al that if you are a college athlete and have had a prior ACL injury, you are 19.6 fold increase risk of re-injury in sports — in either the same leg, or the “normal” leg. Thanks for stopping by and starting and interesting conversation. Thanks for providing some opinions on the trans tibial approach vs the anatomic approach. 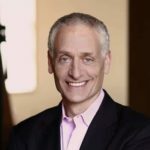 As a physical therapist, I would have to agree with you that patients need a surgeon who knows how to perform any technique correctly; however, if the technique itself has flaws, or has been shown to have poorer outcomes than other techniques, then it really doesn’t matter how well versed the surgeon is in the technique. Agreed? It is my understanding and experience that patients are having better outcomes with the anatomic technique – do you have evidence to support your statement that “I think you could have had the same result with surgeons that do the “old style technique..” ? It’s interesting to me that you state that it is a marketing ploy to discuss different surgical techniques, yet you failed to disclose that you work for Biomet, a company that does not offer a curved reamer to use through the anteromedial port. From my conversations with surgeons, this is one of the tools necessary to perform the anatomic approach to ACLR. Are you able to comment on this? Is this an instrument that Biomet is planning on offering in the future? I’m always glad to have Howard’s website to refer my patients to, for informative articles and videos. I think Howard does a good job of presenting information that benefits patients, and I’ve never felt that this site is used to market specific techniques. Thanks for stopping by Ann. First thank you for such an informative site. I typically do not respond to blogs but felt somewhat compelled after reading Chad’s response. First I find it interesting the stat used for ACL success in 94%. Not sure of the reference but would ask how is success defined in this case? Is success that the graft has been placed and the patient walks out with a new ACL? Is success that the patient returns to daily activity and does not suffer from massive infection? Is success that they have returned to sport? Sadly, that level of success (94%) is just not what the studies say. According to Brophy et al AJSM 2012 and McCullough et al AJSM 2012, only 63% of HS players and 69% of college players return to sport after ACLR. Of those, only 43% return to the same level of play. 20% have a 2nd ACLR in 2 years and 40% have more involvement on the 2nd ACL. Is that success? Holm et al AJSM 2012 showed that 79% of those who have an ACLR have OA in 12 years. Is that success? Rugg et al 2014 showed that NCAA players who have had an ACLR are at a 19.6 fold increase risk of re-injuy with return to sport. Is that success? With these numbers, is the suggestion that had they used the technique he describes using Biomet that these numbers would be far superior? Reason I state all this is that what defines success and what is the research used to support that? To me, success would be future joint health and ability to return to prior level of function without a substanial increase in risk. That said, the studies just don’t report what the device companies often state as success rates. I am not a surgeon or an MD so for me to speak out about technique and which is superior I feel would be inappropriate. I also find it interesting that a Biomet rep would promote the type of procedure his company does as superior to another. Yet, the studies don’t support that. There may be one study but the vast majority of the 1800 papers published in 2012-2013 do not. Essentially, exactly what he is insinuating about self promotion is in fact what he is doing. I am sorry, but I did not see or sense that. I do know, however, what the research says and there are some VERY good studies that are done abroad and in the US on both. Zaffagnini et al AJSM 2014 (Italy) showed that both the anatomical and non-anatomical were both effective at reducing anterior translation, internal rotation and pivot shift. Kondo et al AJSM 2010 (London) showed that the double bundle was superior at reducing anterior translation and internal rotation. To state that one is superior to the other would be hard for me to state but that is also not my call and my perception is that the studies are not clear in this area. What does make sense to me, is if you can biomechanically replicate what is naturally there, it would provide stability closer to the previous anatomical structure. This would mean that the strain induced to the tissues will be closer to anatomical, force attenuation will be better and shear stresses reduced. But the specifics should be the call of a skilled physician. What I do know, is that a skilled surgeon is essential. To your point Dr. Luks, no matter what technique is done, the skill of the surgeon is essential. With over 70% of ACL injuries non-contact in orientation, I would also state that the skill of the post operative PT is also essential. We know that there are anatomical and physiological factors we cannot control, but there are neuromuscular and biomechanical factors that we can. If done right, these reduce the non-contact injuries by 70-80%. Therefore, if the root biomechanical and/or neuromuscular cause of the non-contact injury is not addressed then success is very limited. Again thank you Dr. Luks for the article. Knowledge is power and power is knowledge. The comlexity of this problem is far greater than us all but the more we can educate people on the more impact we will have and hopefully the more ACL injuries that will be prevented. Keep up the great work and thank you for sharing the passion! Dr Trent… Thanks for stopping by! You and your team deserve a lot of credit! You are educating the world about the importance of ACL prevention strategies and see the downsides of people with ACL tears day in and day out. The 94% was in 1 study of about 100 very elite soccer players with all the resources available to them. Also I don’t believe it states if all 100 were AM (antero-medial portal) or TT (trans-tibial). I would be very surprised if many if any were TT. Generally this is the trend for RTP…including the NFL. As for the AM v TT debate. I just rehab the knees, no expert in reconstruction but there isn’t one doc that I work with that uses TT. Research shows the TT approach doesn’t provide the rotation stability needed that AM provides. I am attending http://www.footballmedicinestrategies.com/en/ this week. I look forward to conversing with colleague on your stance. Thanks Julie … I truly appreciate the time you took to put those citations out for us! Interesting discussion and a good review of the literature! I’m not sure where Chad is getting his information from, but at least 2 statements are quite erroneous. First, 60% of the femoral attachment of the ACL is NOT on the “back” of the femur. Depending on your definition of “back of the femur”, there is NO attachment in an area that would require “posterior wall “blowout” to access it. The ACL is attached posterior/proximal on the lateral wall of the femoral notch and is bordered by articular cartilage posteriorly and proximally. Any cursory review of recent anatomic studies will make this immediately evident. Second, multiple recent studies have shown that one cannot maximally and reliably cover the femoral ACL footprint with a transtibially drilled tunnel. To do this consistently, independent drilling of the femoral and tibial tunnels is necessary. This doesn’t necessarily mean drilling through the AM portal, although this is one way and a good way to do it. I am a “high volume” ACL surgeon now for about 20 yrs. I was trained to drill the femoral tunnel through the tibia. About 10-12 years ago, as the anatomy became better understood, I started to aim my tibial tunnels in such a way that it would allow me to hit the femur in the appropriate location. I felt that I got fairly good at this, but it was always a compromise. A good femoral tunnel spot would make my tibial tunnel less than ideal ( short and very oblique ). Going “back in time” to independent femoral tunnel drilling through the AM portal or an outside in technique, allows me to anatomically place the tunnels, on both tibia and femur, where they need to be for that patient, based on their anatomy. This is precisely what Howard is recommending. This is not marketing. Kudos to Dr. Luks for the great patient centered and evidenced based education and care that he provides. Thanks for writing a fantastic blog full of very useful and concise information. i’m learning a lot here. I’d like your advice. I’m 39, 200 lbs. highly active (road/trail runner, road/mt biker, skier, weightlifter, personal trainer by profession) and I recently tore my ACL. Fortunately that’s about all I did. Minisci are intact. MCL has a grade II sprain. No bone fractures. I’m looking at a reconstruction. I’m aware of the various grafts (auto from my hamstring or patella or allo from a cadaver). From what I’ve read, the patellar auto graft seems best for me. I had a discussion w/a non-surgical ortho today and he thought a hamstring might be ideal or possibly even an allograft. I like the idea of the faster recovery with an allograft. From what I’ve read, the allograft is a bad idea for teenagers and such. I have an appt with a surgeon in two weeks and I’ll have a better idea of what to do then. In the meantime, I’d like to get your suggestion. I definitely want to resume all the activities I love and I need to have full mobility and strength for my job. Your input would be greatly appreciated. The three (have to include the quadriceps) auto-graft options are all good. Allografts have limited upsides and significant potential downsides. There are times when we must use it … or should use it… but an elective first time ACL in an active person is not one of the reasons. Wow! It appears that I’ve started quite the discussion by sharing my experiences. Very interesting and I am absolutely fascinated by how much I am learning here. Thank you all for sharing your knowledge. Chad, you bring up some very interesting points. Q-angle?…nope, not me. Narrow notch? – probably, since minor notch plasty was performed at some point. Hormonal influences?- yes, I am female. Treatment of allografts?- don’t know, unfortunately OP reports don’t specify. You didn’t mention biomechanical factors other than hyperextension…which is another negative in my specific case. So the number 1 question that arises for me is: How do you define a successful ACL reconstruction? In my mind, my first 2 ACLRs on R knee were very successful. I returned to collegiate basketball stronger than before, without any pain nor swelling – until the day of re-injury. I bet that in the mind of my surgeon the first ACLR on L knee was successful as well, even though I have not been able to return to the activities I love since and it re-tore while standing and turning. I am not saying that the trans tibial technique does not work well for many people, however, I’m not one of them. And I found out the hard way. Dr. Luks is not my surgeon, I actually have never met him. Yet his social media involvement leaves me feeling like he’s an old friend. I find his website, blogs, twitter and Facebook activity very interesting and informative and thank him for sharing his vast knowledge and experience with EVERYONE, not just the patients who help him pay his own bills. Obviously you haven’t followed his blogs closely, otherwise the thought of him trying to lure patients his way by advertising an anatomical graft position would have never crossed your mind. Thanks Anja … I appreciate you stopping back and the update. Dr. Luks – I live in the Caribbean and coming across your page on the internet and following you on Facebook has been a blessing to me. Literal Blessing!! While playing football in January 2014, I got an awkward tackle to my knee; I couldn’t walk without feeling instability and the doctor gave me two weeks sick leave from work and said to go to the gym and do knee exercises. The MRI I did in April stated I had a partial tear to my ACL, MCL and medical meniscus injury in my left knee. The doctor I went to, who is also the only one on island that do the occasional ACL surgery said that sometime these injury tend to heal naturally in black people; but everything I have read online suggest otherwise. I have been somewhat inactive since just to give my body time to heal, and it doesn’t affect my normal everyday life. But I can feel one leg is significantly weaker the few times I went to the gym or I take the stairs. I love playing pick up basketball with my friends, but I’m fearful to do so now cause in my mind i have a limitation. I feel at times like I’m in a mental prison, trying to live my life being overly careful and not exercising in the fear or re-injurying my knee, as I don’t have the money to see doctor like Adrian Peterson and other sports professionals do. I have gained about 15lbs this year alone, so i’m up to 280lbs and my height is 5’10. I would love to come to your office in NY and get a second recommendation as to what to do. In the meantime. I want to live a normal live and enjoying playing sports with my children. You feedback or input on my story would is requested… Can I start to play sports now? Will i get a complete tear instead? Can i live a normal life after an ACL surgery?… or would I have to get a knee replacement surgery 15 – 20 years from now?? All very good questions Khari… and thank you for the kind praise. If you have an unstable knee with a partial or complete ACL tear then your activities are limited. It doesn’t really matter if a partial tear becomes complete… you have instability, weakness and apprehension — that’s what matters. Many people return to a very active lifestyle after a well executed ACL reconstruction. Whether or not arthritis might set in in the future is a possibility… but that probably should not enter into your decision making now. Your second tip is a big one for me. A surgeon should know exactly what they’re doing. Just because they’ve done some type of orthopedic surgery in their past, it doesn’t mean they’re the most qualified now. It’s always a good idea to ask them about their experience and the injuries they commonly treat. Any thoughts about a 15 year old female, congenitally mission the ACL? Orthopedic consultation yielded a reccomentation by the surgeon to pursue PT and lost 10-15 lbs (patient is and will remain 4″10″). The problem is she has impaired impulse control, (FASD) IQ and learning delays. Food and TV are simple and accessible comforts for her, though we try to divert that. My hopes for the future are realistic and I doubt greens will supersede them. I have personally witnessed 2 falling down stairs accidents (head over heels) and we’ll be lucky to arrive at 18 without a broken bone (or neck!) We have monthly sprains, strains, knee popping out, pain, swelling, Ibuprofen and limited mobility frequently She did do drill team, but as always, the night before final performance, the knee collapsed. Do we live with this as is? Do we seek a virgin ACL construction (not re-construction) aside from the first surgeon’s opinion? Do we just hope PT and 10-15 lbs weight loss (unlikely) does the trick? What should we do? I would assume that years of this will yield arthritis, etc and things getting worse. Any comments you can offer, generally? Dr. Luks I’m just finding your site and I see some really good information and would like some feedback about my situation. I injured my left knee on March 4th,2015 and the MRI is showing a complete ACL tear and avulsive fracture. This is my first knee injury and I am very concerned about what method to take for recovery. I am a 36 yr old moderately active wife and mother of two toddlers. Allograft is what is being suggested. I am considering autograft as I don’t like the idea of a foreign object and feel that my own tissue will do better. However, was warned about pain and additional heal time. I also am concerned as I don’t have full flexibility of my knee. Based on information I have read I also feel like I need physical therapy to avoid permanent difficulties and recovery after the surgery. Please help me!!! Anyone please feel free to give me your thoughts. You are correct … having pre-habilitation to improve your ROM and strength is critical! IT also allows you to meet with your PT team and see if they are a good fit! No doubt that autograft has advantages … it does heal faster. The difference between an allograft and hamstring autograft from a pain perspective is not very different at all. A patella tendon graft will hurt more for the first week. Good Luck on your decision making! Dear Doctor, I am 48 years old, while playing tennis my knee got twisted and my left knee ACL is torn completely. Until now there is no instability or buckling. I can walk, jog, climb stairs, can stretch and flex my knee almost completely with minimal discomfort. I am willing to give up tennis and do thread mil as well as swim. I am willing to use a brace while climbing stairs and jogging. Is ACL reconstruction surgery a must for my age and conditions. It is not a must… We perform ACL surgery on people with instability. Very informative article and comments. Do you have any views on the various screw types used for ACL surgery? How much sense does it make to use the biodegradable type or not? It seems the surgery is costlier with those. Bio screws have been disappointing. They tend to be weaker and can leave a hole in the bone during reabsorption.